In multicellular autotrophs, the main cellular structures that allow photosynthesis to take place include chloroplasts, thylakoids, and chlorophyll. The chemical equation for photosynthesis is 6CO2+6H2O→C6H12O6+6O2.6CO2+6H2O→C6H12O6+6O2. In plants, the process of photosynthesis takes place in the mesophyll of the leaves, inside the chloroplasts. Chloroplasts contain disc-shaped structures called thylakoids, which contain the pigment chlorophyll. Chlorophyll absorbs certain portions of the visible spectrum and captures energy from sunlight. 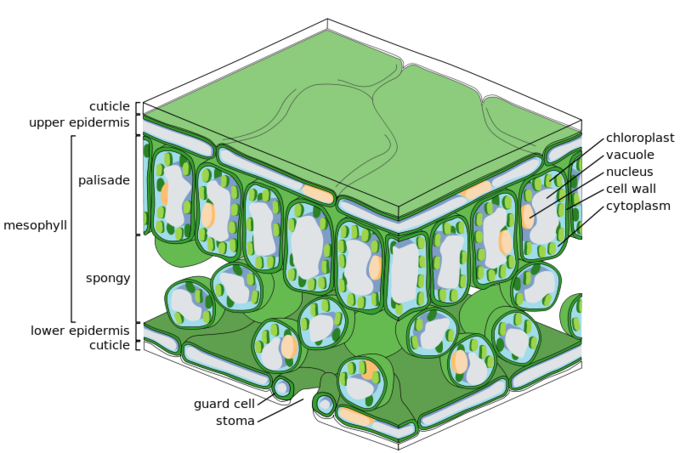 mesophyll: A layer of cells that comprises most of the interior of the leaf between the upper and lower layers of epidermis. stoma: A pore in the leaf and stem epidermis that is used for gaseous exchange. Photosynthesis is a multi-step process that requires sunlight, carbon dioxide, and water as substrates. It produces oxygen and glyceraldehyde-3-phosphate (G3P or GA3P), simple carbohydrate molecules that are high in energy and can subsequently be converted into glucose, sucrose, or other sugar molecules. These sugar molecules contain covalent bonds that store energy. Organisms break down these molecules to release energy for use in cellular work. Photosynthesis: Photosynthesis uses solar energy, carbon dioxide, and water to produce energy-storing carbohydrates. Oxygen is generated as a waste product of photosynthesis. 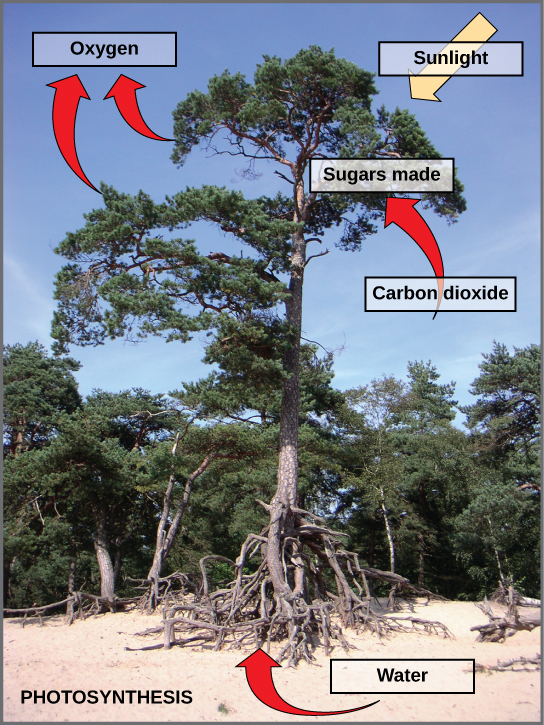 The energy from sunlight drives the reaction of carbon dioxide and water molecules to produce sugar and oxygen, as seen in the chemical equation for photosynthesis. Though the equation looks simple, it is carried out through many complex steps. Before learning the details of how photoautotrophs convert light energy into chemical energy, it is important to become familiar with the structures involved. Chemical equation for photosynthesis: The basic equation for photosynthesis is deceptively simple. In reality, the process includes many steps involving intermediate reactants and products. Glucose, the primary energy source in cells, is made from two three-carbon GA3P molecules. In plants, photosynthesis generally takes place in leaves, which consist of several layers of cells. The process of photosynthesis occurs in a middle layer called the mesophyll. The gas exchange of carbon dioxide and oxygen occurs through small, regulated openings called stomata (singular: stoma ), which also play a role in the plant’s regulation of water balance. The stomata are typically located on the underside of the leaf, which minimizes water loss. Each stoma is flanked by guard cells that regulate the opening and closing of the stomata by swelling or shrinking in response to osmotic changes. Structure of a leaf (cross-section): Photosynthesis takes place in the mesophyll. The palisade layer contains most of the chloroplast and principal region in which photosynthesis is carried out. The airy spongy layer is the region of storage and gas exchange. The stomata regulate carbon dioxide and water balance. 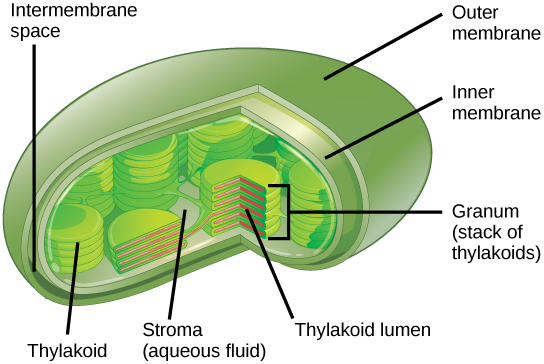 In all autotrophic eukaryotes, photosynthesis takes place inside an organelle called a chloroplast. For plants, chloroplast-containing cells exist in the mesophyll. Chloroplasts have a double membrane envelope composed of an outer membrane and an inner membrane. Within the double membrane are stacked, disc-shaped structures called thylakoids. Structure of the Chloroplast: Photosynthesis takes place in chloroplasts, which have an outer membrane and an inner membrane. Stacks of thylakoids called grana form a third membrane layer.